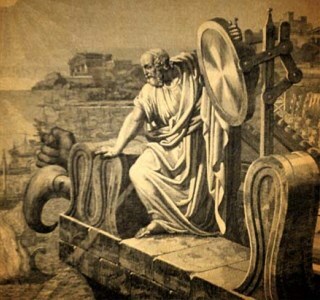 Solar energy has been used for over 2700 years. In 700 BC, glass lenses were used to make fire by magnifying the sun’s rays. 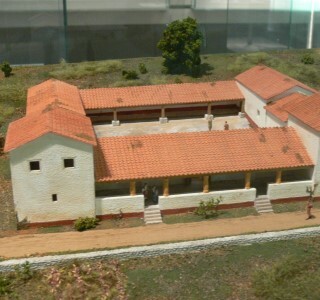 The Greeks and Romans were the first to use passive solar designs. Buildings with south facing windows allowed the sun to heat and light indoor spaces. In 1447, Leonardo Da Vinci predicted there would be a industrial solar use. Using solar power to heat water. The first silicon solar cell, the precursor of all solar-powered devices, was built by Bell Labs in 1954. In the 1960s the space industry began to use solar technology to provide power aboard spacecrafts. The Vanguard 1 — the first artificial earth satellite powered by solar cells — remains the oldest manmade satellite in orbit – logging more than 6 billion miles. Photovolataic cells were next widely used for small consumer electronics like calculators and watches. 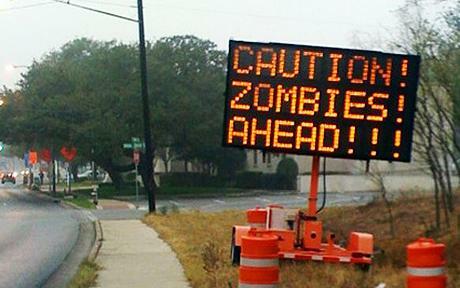 Many road and traffic signs also are now powered by PV. In most cases, PV power is the least expensive form of electricity for these tasks. 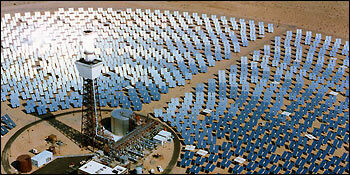 The largest solar power plant is located in the Mojave Desert in California. The solar plant generates 90 percent of the world’s commercially produced solar power! More energy hits the earth from the sun in one hour than the whole world uses all year. If you’re a numbers person – approximately 120,000 terawatts (TW) hits the earth’s surface each day. Over the course of a year, the world uses a mere 15 TW of energy. Estimates say that one square foot of solar panel gives an output of approximately 10 watts of power. Solar Energy is measured by the kilowatt-hour. One kilowatt = 1000 watts. Using solar energy produces no air or water pollution and no greenhouse gases. One kilowatt-hour (kWh) of energy will burn a 100 watt light bulb for 10 hours. Solar energy is a very reliable source of energy. The sun shines every day without fail. When located on buildings, solar energy systems have minimal impact on the environment. It’s no secret that solar energy is the way to a more sustainable future. Solar panels can produce 1-kilowatt (KW) solar energy unit to replace the equivalent of burning 170 pounds of coal and 300 pounds of carbon dioxide. Germany is known to be the leader in solar panel installations. The others on the top are Italy, Japan and USA. Aside from occasional cleaning solar panels are virtually maintenance free and will last for years, many panels have guarantees in excess of 20 years. Once solar panels are installed there are no recurring costs. Solar panels are the only home improvement that pays for itself. Solar panels actually increase the value of your home by up to $25,000! This is like having extra money in the bank. Federal and state tax incentives for those who qualify on the installation of a residential or business solar system. These incentives often combine with other rebates to allow for $0 out of pocket installation. The Solar Foundation reports that solar industry is creating jobs six times faster than the overall job market. Plants are one of the ways in which we use solar energy without even knowing it. The sun is also the main source of non-renewable fossil fuels (coal, gas and petroleum) which began life as plants and animals millions of years ago. Plants use the Sun’s energy to power a chemical reaction called photosynthesis. Whether you are a vegetarian or a carnivore the food you eat daily starts out as solar energy. People are solar powered too, our bodies also need solar energy to perform certain important chemical reactions like creating vitamin D.